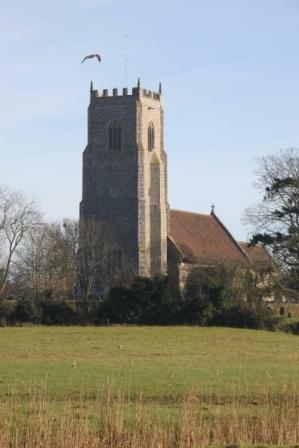 Surrounded by marshland rich in bird and animal life, the church stands to the north east of the village. Reedham is one of the oldest recorded religious establishments in Norfolk – records show that a church, founded by Bishop Felix of Dunwich, has stood on this site since the 7th century. The north wall of the present building is thought to be the earliest existing part of the church, possibly built in around the 11th Century. Part of the wall is exposed showing a herring bone pattern of reused Roman tiles; the exterior of the church reuses grey stone blocks, almost certainly also Roman. Further archaeology is exploring where all this material came from; the stone matches that used at Brancaster Roman fort and it seems extremely likely there was once a large Roman structure here also. The church has been enlarged, probably in the 13th century. It has an unusual interior as there are two large arches side by side under one roof. The tower was built in 1447 after Thomas Berney left a legacy for this purpose. Margaret Paston, of the famous Paston Letters, also left money for the tower as Reedham was her birth place. Today the south chancel aisle, dedicated to St Helena, is known as the Berney Chapel, but was previously a private chapel for the de Redham family. It contains the altar tomb of Henry and Alice Berney (1584), showing the couple as kneeling figures with their five sons and four daughters. There are other tombs of the Berney family in the floor, and a possible ‘Easter Sepulchre’ tomb may also have been a Berney memorial. There are two small carvings outside the chapel window of King Edmund, King of East Angles 841 to 870 AD, and his Queen. Edmund was murdered by the Danes in 869 at a battle at ‘ Haegelisdun’. Legend tells that the Danish invasion was provoked after King Edmund’s huntsman, Bern, murdered Ragnor Lothbroc, who had been cast ashore at Reedham. Cast adrift in his turn as punishment, Bern is said to have told the sons of Lothbroc that he had been murdered on Edmund’s orders. More recently, in March 1981, a fire swept through the building, destroying most of the relics and memorials, and only leaving the tower and walls intact. The villagers of Reedham rebuilt the church in less than two years. The East Window and Berney window now have stained glass by the distinguished artist Sarah Bristow, and the American Ash pews are by John Barnard. It now is the meeting place for a Messy Church (the pews are moved around on a regular basis to accommodate this), as well as for concerts, exhibitions and regular church services (both BCP and Common Worship). You are welcome to make yourself a cup of tea or coffee and use the toilets when the church is open (we aim to open the church daily, although the time may vary.) As you look around the church take time to consider that people have worshipped here for over 1300 years.